I'm back again with fresh cornrows. I like this hairstyle especially the blue. I'm stepping out in some bold colors with my hair. It's a protective style that I absolutely love and I don't have to do anything at all to my hair besides wrap it in a scarf at night and use a light oil occasionally to prevent dryness. I am going to wear this style until about the 15th and then I am going to get a different color and style for the latter half of the month. I am going to be working out everyday this month. So I want to make sure that my hair and scalp are cleansed and conditioned. 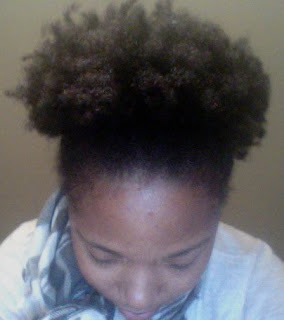 I am going to take a break from the braids sometime in December to allow my hair to rest. 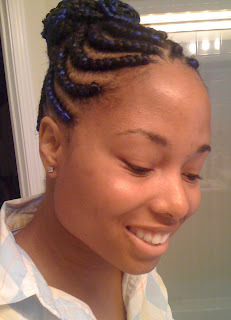 Just make sure if you do decide to get braids that they are NOT too tight. Taunt is ok, you do want the hold. But if you get out the salon and feel like you got a face-lift. Um, you might want to get them taken out, that is entirely too tight. Don't add that type of stress to your hair. I hope that everything is going well with everyone. I'll be back soon. I've been pretty busy lately but I haven't forgot about y'all.